Shortly after accidentally dumping water on my computer and letting it dry out, it developed an odd error where the battery always indicated that it was empty even when it was fully charged. I searched unsuccessfully for a fix before finding a simple one of my own. 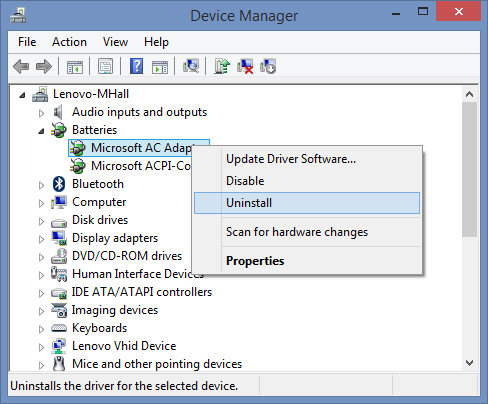 This worked on a Windows 8.1 machine, but a similar fix will probably work on any version of Windows. 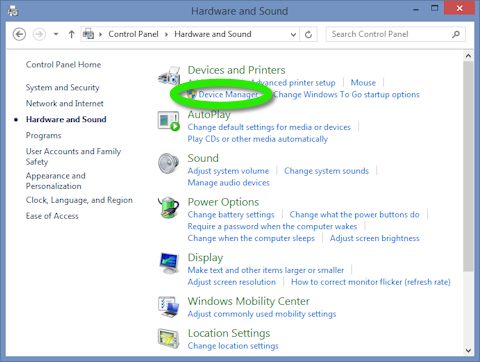 In the side menu, left-click Settings to open the right-side Settings menu. 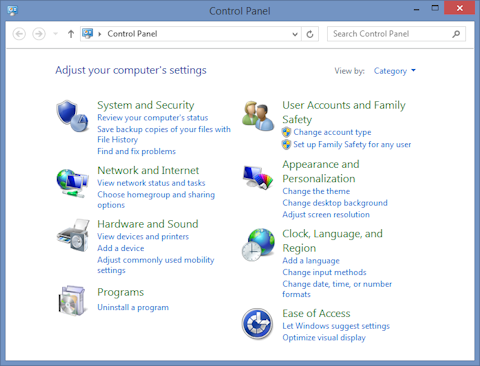 In the Settings menu, left-click Control Panel to open the Control Panel window shown below. 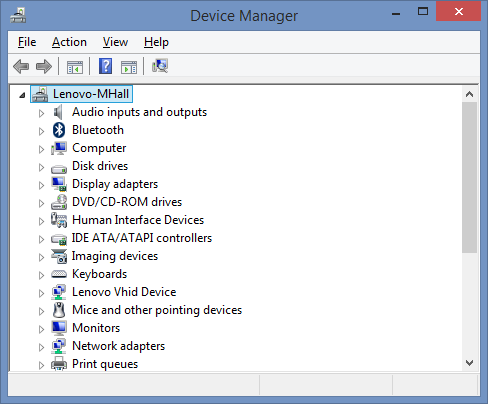 Left-click Hardware and Sound (see above) in the Control Panel to open it. 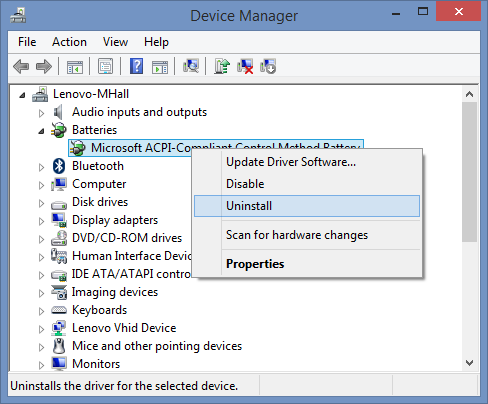 Left-click Device Manager in the Hardware and Sound window (below) under Devices and Printers. A dialog like the one below may pop up. 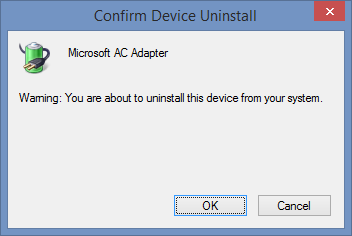 Left-click the OK button to confirm the uninstall. Repeat those steps for each driver. When you are finished, the category for Batteries will be gone. 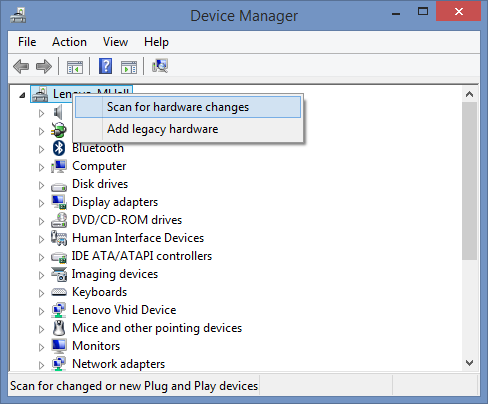 Right-click the main computer icon to open the context menu shown below, and left-click Scan for hardware changes, as show below. This will replace the drivers. However, you may need to restart the computer to reset the battery indicator. 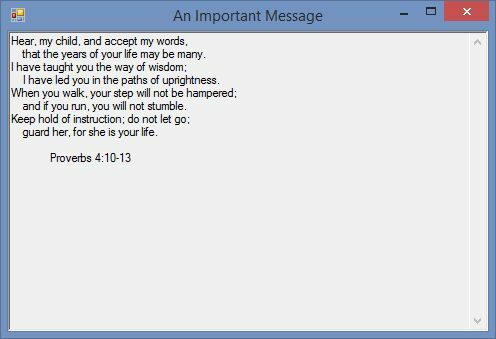 Although it is possible to use a simple MessageBox for printing messages, it is sometimes convenient to use a window that you have more control over. 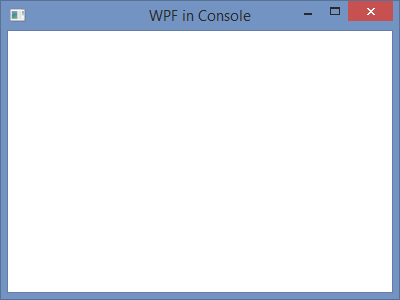 Below, I have the C# code for a simple console application named “MyConsoleApplication.” I created the project using the Console Application template, which creates the empty Main() function shown below. The code file is named “Program.cs” for simplicity, but it could be named anything. We need to add a reference to the assembly System.Windows.Forms, in order to be able create Forms in the code. 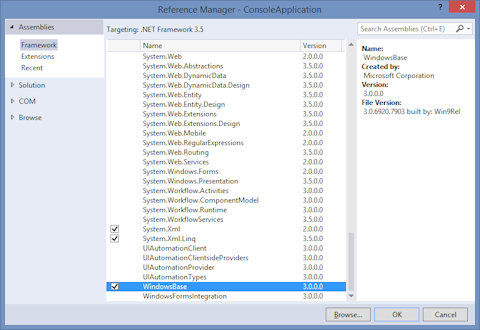 We also need to add the corresponding using directive using System.Windows.Forms; at the top of the code file. Finally, we need to add a reference to the assembly System.Drawing in order to set the size of the Form in the line: qMyForm.ClientSize = qMyTextbox.Size;. 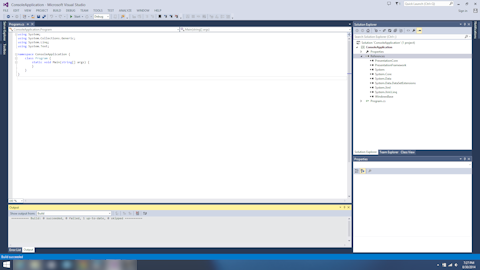 Beyond that, the code that I have added is all inside the Main() function. First, I create a Form and add the text “An Important Message” to the title bar. Next, I create a TextBox and set its size to 400 by 300 pixels. Then I set it to accept multiple lines of text, enable the vertical scrollbar to accommodate text overruns, and set it to be read only so that the text cannot be modified. The middle block of code consists of several calls to the member function AppendText(). Each call adds a line of text from the Bible, Proverbs 4:10-13. The character sequence \u000D\u000A is the unicode representation of the carriage return and linefeed characters. So, that moves the text to the beginning of the next line. On a related note, the TextBox has word wrap enabled by default. The third block of code sets the size of the containing Form to have a client area that is the same size as the TextBox. Then the TextBox is added to the Form, and the Form is displayed via a call to ShowDialog().